A helper to manage workspaces composed of git repositories. 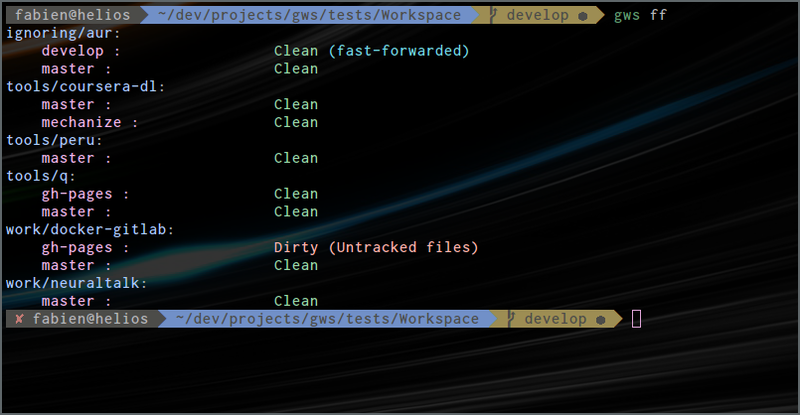 gws is a KISS, bash, colorful helper to manage workspaces composed of git repositories. If someone made a package for your distribution you are lucky. You can put it directly in /bin as root user, but it is complicated to keep it up-to-date. It is also possible to put it in your home folder, for example in ~/.local/bin. You have to be sure that this folder is in your $PATH. For bash you can include any directory on your $PATH by including export PATH="$PATH:/path/to/scripts/dir" in your ~/.bashrc file. On Mac OS X, it may be necessary to upgrade bash to have a version > 4.0. It could be done with: brew install bash. On a side note, I could also suggest you to have a look at peru which permits to keep files from different sources up to date with one command. Clone all missing repositories with gws update. 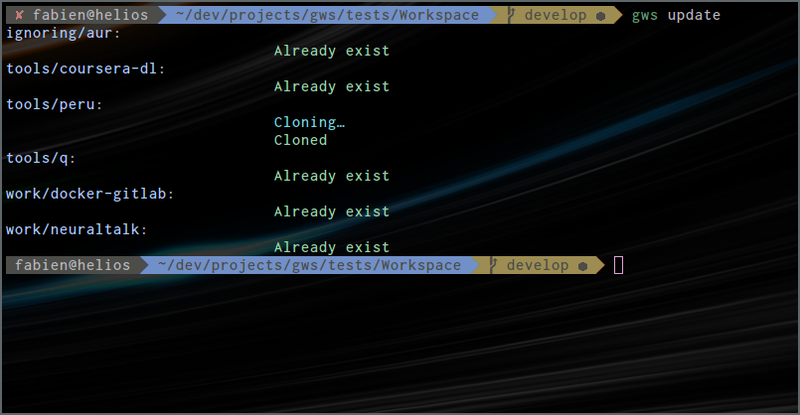 Show the status of the workspace with gws. It reveals which repositories are clean, which ones have uncommited changes, or even to know which ones are not up-to-date with origin. Now, when you need to get your workspace on another computer, just clone the dev repository, for instance again to the ~/dev folder. Go into it and do a gws update. Everything is cloned and ready to be hacked! You want to add a new project into your workspace? Add it to the .projects.gws list, do a gws update to get it. Then commit and push the .projects.gws file, so when you arrive at work for instance, you just need to do git pull on the ~/dev folder and then gws update to find the same workspace structure that you where having at home. where aur, habs, gws, imaxplore, teafree, config are git repositories. Since I use at least three different computers, one laptop, one at home and one at work, I like to have the same folder structure on all of them. Of course remembering which project was added recently on others computer and in which folder is tedious. So I started to thing about using git submodules to register all projects on which I am working and syncing them with git between the two computers. But clearly git submodules are not usable because they are working on specific commit and are not following branches. No worry. The problem is pretty trivial, so I decided to start write a little bash (YOLO) script that read a simple list of repositories, and clone them if they don't exist. And then, commit by commit, the script as grown to finally become a helper to sync, monitor and check workspaces. I thought it can be useful to other people, so I made a little cleanup, write a small documentation, and there it is. I hope you will enjoy it! It can use an ignore list, named .ignore.gws, containing regular expressions which discard some specific projects, for instance to disable on your home computer the work-related projects. It can detect already existing repositories and create the projects list from that. It can clone non-existing repositories from the projects list (but not supress them in case of removal, you have to do it yourself for safety reason. Notice that there is the check functionnality to identify those unlisted repositories). It can monitor all listed repositories in one command (uncommitted changes, untracked changes, branches not synced with origin, ...). There can also be blank lines, comments or inline comments. Comments start with # until the end of the line. The folder paths can be any valid linux folder path not containing |, # or spaces. The remote names can be any string not containing |, # or spaces. The remote urls are passed to git as-is, so can be anything accepted by git, but must not contain |, # or spaces. For instance if you have SSH aliases in your config they are accepted. This function is really usefull for ignoring locally some projects that are not needed nor accessible. Except for cloning repositories, this script has not for goal to interact with your repositories. So no pull all, push all, delete all unused, functionnality will be implemented (except fast-forward). This will imply too much checking to ensure no loose of informations. Instead, just look the satus of the repositories and do needed actions manually on regular basis. You can use the commands from any subfolder of the workspace (as git does for instance). The file .projects.gws can easily be verisonned to sync the list of projects on which you are working between different computers. The file .ignore.gws permit to keep the same .projects.gws list on all computer, but to localy disable some projects (for instance work-related projects at home because they are unneeded or even not accessible from there). gws check can be quite slow (for instance if the workspace is the home folder) because it searches all existing git projects recursively. This project aims to stay simple. I will try to keep the project as alive as possible for a bash script, by correcting bugs and maybe some improvements. Also, maybe one day, if I have time, I will rewrite all this script in python or other more maintainable language. Edit: It seems there will be a continuation of this idea, and it will be written in OCaml! I'll let you know if the project maturate! In any case this project will stay here for users who want something simple and portable.